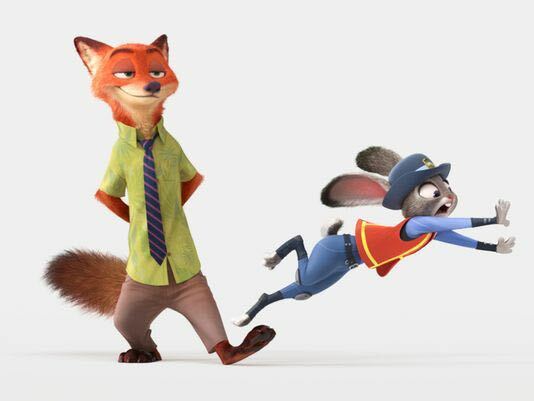 ComingSoon.net recently ran an article summarizing an article in USA Today (the Internet is so circular sometimes…) about Disney Animation releasing a preview image from their upcoming 2016 CGI feature Zootopia. The new picture gives us the first glimpse of lead characters Nick Wilde (fox, voiced by Jason Bateman) and Judy Hopps (rabbit, voiced by Ginnifer Goodwin) as they’ll actually appear in the finished film. For those who don’t know, “The story involves these two characters who don’t get along at first but must work together when Nick needs Judy’s help getting out of a jam as she’s trying to crack a big case. [Co-director Rich Moore (Wreck-It Ralph)] describes the film as the story of ‘two animals who would naturally never hang out or like one another in the beginning, but over the course of the movie develop a relationship and become friends.’ So apparently, it’s a buddy comedy via anthrapamorphic Disney cartoon characters.” And apparently, the writer for ComingSoon.net doesn’t know how to spell “anthropomorphic”. Anyway, the film’s other director is Byron Howard (Tangled) and it’s set to be released in March of next year.